South Africa assistant coach Matt Proudfoot will be looking foward to Saturday's Test match at Murrayfield. Scotland and South Africa meet in the much-anticipated Autumn Test on Saturday evening at BT Murrayfield and on the coaching front, it will be a case of ‘friends reunited’. 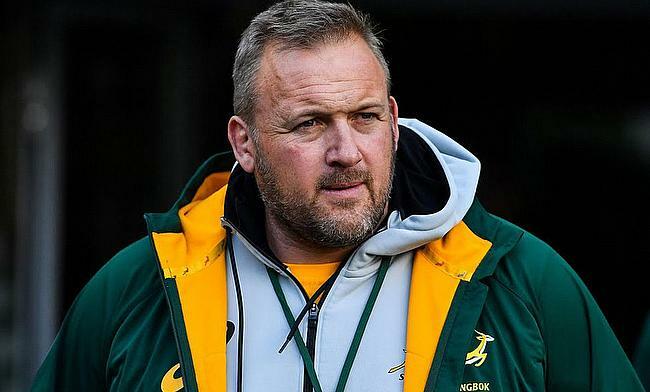 Proudfoot is now South Africa’s forwards coach, but with a grandfather that hailed from Kilmarnock, he was able to earn four caps for Scotland between 1998 and 2003. And during the 1998 tour of Australia and Fiji, the former tighthead prop was Townsend’s roommate. He also played with Scotland defence coach Matt Taylor with the Border Reivers and looks back on his time in Scotland with great fondness. Indeed today, Proudfoot is utilising his day off to travel down to Melrose - the town where he first moved to when he arrived on these shores - with former team mate and current Scotland under-20 head coach Carl Hogg. “They were special times in Scotland,” the 46-year-old told TRU at the Springboks’ Edinburgh base on Tuesday. “I came over to Scotland with memories of a grandfather who brought me up on Five Nations rugby. So, to play for Scotland in the end was a dream come true. “I have fond memories of the David Sole side of 1990, with Tony Stanger scoring his try on the right wing to help Scotland win the Five Nations. Those were my memories as an English-speaking boy in South Africa at that time. “When I came here and got given my opportunity with the national side it was like living a dream, living an adventure. That's what made it special. Even though you were on a bus for 12 hours [to Wales for club matches], you were on a bus with your mates. “Rugby is about memories. You spend a very short time of your life doing what you love with your best mates. It was an adventure, something new, and that's what was great about it. When you are involved in rugby you are a custodian of the game for the next generation and if you leave it in a better state than you found it, those memories are happy memories. “When I first arrived in Scotland, I certainly had my eyes opened. “In South Africa everything was up in the air. We carried high, tackled high, scrummed high, mauled high. I came here and [coach] Jim Telfer wanted me way down low. “I was 20 stone and I looked at him and said 'are you mad?'. “He said ‘get down there boy' - it took me right out of my comfort zone. It was May 1998 when Proudfoot, then 26, made his debut for Scotland in Suva in Fiji. It did not end well for the visitors, losing out 51-26, Proudfoot wearing number three and Townsend in the number 10 jersey. “On that tour, Gregor and I were roommates,” Proudfoot, who also played for Edinburgh and Glasgow during his stint in the northern hemisphere, continued. “I always remember the day they slipped the teamsheet under the door in the hotel ahead of that first cap in Fiji and he opened it, jumped on top of me and gave me a bit of jip. “He is a perfectionist. I think, especially as a young player, people thought he was all over the place and his team mates did not know what he was going to do, but he is a very talented, intense guy and a good guy. “Scotland this Saturday are going to be difficult. They are a very good side. What Gregor has done with the team means they have a lot of momentum, he is a very smart man. “I think their resources are well utilised and they are a tough side to beat. To score over 50 points last Saturday against Fiji was impressive and I thought they got better as the game went on. “Scotland are probably technically a lot better than the last team we played in the shape of France at the breakdown. The French are very physical at the breakdown, the Scots are a lot better, a lot sharper, more intelligent about where they pilfer. The challenge is slightly different. “The biggest weapon they have is their continuity play, I think. They apply pressure to your kicking game and then counter from that and keep the continuity going. I think the pace of their attack is very, very good. On their November tour so far, South Africa have lost 12-11 to England and then beaten France 29-26. After Scotland this weekend, they finish with another tough test against Wales in Cardiff on November 24. This week’s squad is named on Thursday with the coaching team hopeful that Eben Etzebeth will be back in the second-row while there is “a little bit of doubt” around tighthead props Vincent Koch and Frans Malherbe, but they are expected to be fit. No.8 Warren Whiteley is “probably doubtful” with a calf problem. Proudfoot concluded: “I think our performances are getting better throughout the tour.